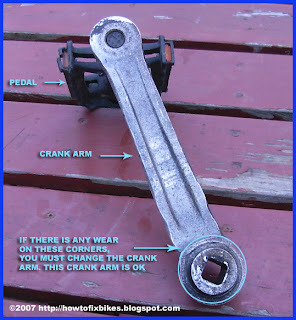 One thing that I've seen often in bike repair and experienced myself was to have a crank arm just falling off the bike. Now if that doesn't ruin your day, imagine a few days later riding along all proud of having fixed the problem, riding with joy, birds singing in the trees, life is good....and the darn thing falls off again! Of course this happens in the middle of nowhere with no handy tools at hand. Option A: Pedal with one leg Option B: walk and push the bike home. To prevent this from happening in the first place, take the time to tightened the nut attaching the crank arms to the axle at least once a year. This can be done with a 14mm socket ratchet wrench. If your crank arm just keeps on falling off, even after you've asked your muscle building neighbour to tighten that nut as if his life depended on it, there is one simple reason. When the crank arm is loose and you pedal with it, you damage the four corners of it's socket that rest in the axle. Somehow this damage causes the crank arm to wiggle enough to unscrew the nut little by little until it just falls off again. You will have no choice but to replace it. You can try locktite, but I've had no success with that either. Bring the old crank arm with you to make sure you buy the same size, that's unless you have a leg shorter than the other! Thanks for this article. It's the exact problem I'm having at the moment and your information was very helpful. I knew I wasn't the only one who encountered this situation. You are both welcomed. Always great to hear those stories. Makes my day. I wonder if you use JB Weld or something like it instead of locktite ? I am a bike amateur. My problem is that my right pedal fell off during cycling. I tried to replace it however I think in doing so I destroyed the threads both on the pedal as well as inside the crank arm where the pedal attaches. How do I remove the right hand side crank arm and get it re-threaded or do I simply buy a new crank arm ? Also do I get the pedal re-threaded or buy a new one ? Does Walmart have these replacement parts or do I have to go to a cycle shop ? If anybody tries JB weld, let us know how it turns out. So far nothing as worked to remedy this problem except for a crank arm replacement. As for removing a crank arm, you will need a special tool. Check out the article on how to remove a 3 piece bottom bracket in the sidebar. Rethreading a pedal is not worth it in my opinion. If you get pedals at Walmart, you'll get what you pay for. Good luck. Gerry, how tight should the crank bolts be? I read that you need a tourque wrench but they are big $$$. Thanks for posting this article. Tighten them as hard as you can. Go back after a week of riding and tighten them again if needed. How do you know it's the crank arm rather than the bottom bracket? It seems like the threads on either could be shot. I've got overly expensive cranks and bottom brackets, so I just want to double check before I break my budget buying either. The axle is made with very strong steel. I've never seen a broken BB axle in my life. I would be very surprised that the axle itself would be used up enough so that the crank can't seat properly in it. Do you have another crank arm lying around? If so put it on your BB just to try it out and if it doesn't fall off, it is definitely your crank arm. i believe that my ballbearings have gone in my crankset as both pedal arms move from side to side after looking at this i removed the ntus yet the pedal arm doesnt remove and still wont after a good whacking why is this please contact me on ashby25@hotmail.com dorp an email please. im having that problem with my bike but i wasnt sure if i had to replace both of my crank arms because my left side one keeps falling off, also where is the best place i can purchase a crank arm and how much will it likely to be? Just replace the one that fell. You can get one at your local bike shop. Figure around 10 to 15 dollars. there is something to be done!!! the thing is,that both the axle and the crank bolt are made of iron and the crank is made of aluminium alloy,so,if the bolt wasn't tight from the start,the alluminium,being a softer metal,deforms and the small pieces of it,acctually act as a grease,if you will.anyway,notice the small teeth on the crank bolt-they're the ones,that keep the crank in plase,eating into the alluminium. Thanks for the info benz. The long text was worth it. Now I wonder if this trick could work on a steel crank arm? I've had this happen to me twice with steel crank arms. this is great blog. I'm a new comer to bikes and your tips are awesome. It's very helpful! Quick one: the pedal falls off, because it's broken, but the washer in the inner part of the crank arm is also not in a good shape. Any chance I can replace that without changing the arm crank? MM I'm not sure what washer you are talking about, but if it's the pedal itself that fell off, you should be able to replace only that part. Hi this was the exact problem with mine but now my problem seems to be that the peddal arms are no longer aligned, so instead of being at 180degrees to each other its more like 135degrees now. How can i fix this? One of your crank arms seating socket must be chewed something major! It is most probably the one that kept falling off. Your only option is to replace it. I would be very much surprised that the axle is distorted in any way since it is made from hardened steel. However, I could be wrong since I've read of strange things happening to bikes since I started this blog. i died laughing when i saw the subject's title. i/we hear this all phrase all the time in the industry. anyway see you soon. So it seems this happens often every where. Thanks that defines my problem. Unfortunately that means I need to buy a new crank arm. I would be very surprised that the threads on the axle are gone. The crank seating must have rounded off and you'll ave to replace it. Check the axle's thread first to make sure. Oh man, thanks! My exact problem. Very helpful! Awsome gerry,great advice.I was trying 2 fix it myself.new crank arm on it's way. This just happened with my NEW bike. I tried lock-tite, worthless. Then I went to the hardware store and bought a "nylock" nut, but the nut supplied with the bike has 14mm faces. The standard M10x 1.25 nut has 15mm faces. You can't fit a 15mm socket into the recess to tighten the nut. I finally solved the problem by tightening the nut as hard as I could, then buggering up the threads with a small chisel, so the nut can't back off. You will still be able to remove it with plenty of elbow grease. On every bike I have owned, this happens on the Left crank arm. The problem could easily be solved if manufacturers put left-handed threads (turn anti-clockwise to tighten) on the left pedal and crank. You could also try a "jam nut." Tighten the first one as hard as you can, then screw another one down on top of the first one, again, tightening as hard as you can. Maybe a lock washer between the two nuts would help? Those are great insights. Thanks for sharing it them with us. I am having the same problem that my crank arm is falling off, but it well off brand new. The only change was that I did paint it black as they didn't have a black one at the moment, so I wanted it to match the old one. Think the paint makes it fall off? I see you posted this in '07, but it's still very relevant. My parents bought me a expensive, new bike about 5 years ago and i didn't ride it much because of this problem. Thanks for the info! Hopefully now this bike can finally get used like it was intended for! Great to hear Liz. This type of information is ageless. Juan, if you painted the inside of that square hole that goes in the axle, yes. You'll have to replace that arm again. I had the same problem, got the crank replaced, came off again, tried to glue the bolt on from inside came off again, read this article had the loose arm, removed all grease from left side now pedal fits snug and does not move at all, am really hoping that this works. So it fell off again and after re reading the problem I decided to try something. First I washed all pieces to totally remove all residual signs of grease. My thought: lets put a barrier between the crank iron and crank so I put 2 pieces of duct tape over the hole on the crank and cut to fit so it covers the hole and attaches to the sides, cut the duct tape in the center to the shape of a T, then I put a couple rows of plumbers tape on, then you have to gently hammer the arm to fit on with the tape then screw on the screw and tighten. Hopefully this will work, I will post results after next ride. Sorry Donna but I seriously doubt that your last attempt will work. You'll have to replace that crank arm. After having a brain-fart and forgetting that I had a socket set, I found this blog and it helped me tremendously. Thanks so much. If you weld it your only option after that to do maintenance on the bottom bracket bearings will be to cut that arm off at the axle. The axle will be very hard to cut btw. I wouldn't do it unless I'm not planning on keeping that bike long. Any good bike shop should have those in stock. They are 99% standard on all bikes. Thanks for the article. I was able to fix the problem based on what you wrote, and your advice to secure them once a year was helpful. Glad my article could be of service. Never really posted on these things. I've had this problem. I tried using a dodgy wedge. By forcing some paper in the gap created by the bending of the metal. This works for about 10 minutes. I've realized by reading on here that that arm is pretty much dead to the world, so sacrificing it but also trying to get some extra use out of it, I've tried another hack. Been as the metal is soft enough to be bent using force. If you really need it re-attaching you can just hammer it using some wood over it to force the metal to shape around the axle. This gives you another few weeks while you find a replacement. I don't recommend it as a fix though. Immense article I just had this exact problem on the ride home from a 12 hour night shift as you all can imagine if I had big ears and a bushy tail I wouldn't be a happy bunny cheers dude!! Glad to have another satisfied reader. I tried to use JB Weld, it held for about two days and then fell off. I even created grooves in the surface so it would bond better, but to no avail. Figured I'd let you all know! But my pedal arm is starting to fall of just after the tightening. Does this mean that i have to change hole thing? My grandson has the Roadmaster Grand Peak 26" and the Crank Pedal Arm kept falling off so I had the Crank Arm given to me and I replaced it. Within 10 mins. of the replacement, it came loose again...what can I do to fix this problem? Either the replacement crank arm was damaged as well or the axle has an issue. You really have to tighten those hard and do it again a week later.